Investing in a waste plastic to fuel machine will benefit you a lot. Because it will bring you a lot of earnings. The raw materials it can dispose are waste, but the end products you get are useful energy. Besides, the environmental benefit is also clear. Here we will introduce you some more details about this machine, so you can make up your mind to make an investment. To meet the demands of different customers, we have six models of machines for customers to choose, such as BLJ-06, BLJ-10, BLJ-16, BLL-20. They are classified basing on the operating methods and capacity. We try our best to satisfy the demand yours, and hoping you can get the best product from us. 1. Put dried raw material into reactor after it is delivered into stock bin by conveyor belt. Total quantity shall be controlled under 2/3 of reactor for rotating more smoothly. Then sealed door for feeding shall be closed. After that, open the heating system. 2. Two stages are included for pyrolysis. The plastic to fuel conversion needs high temperature. From 100℃ to 250 ℃ is the preliminary stage. The light oil gas shall be released at 100 ℃ and fluid oil shall be released at 120℃. From 250℃ to 280℃is the top output rate interval. Oil gas will begin to be collected into manifold, heavy particles and oil will be gathered and liquefied in center of manifold and drop down into the heavy oil tank. The lighter gas will rise up to the multifunctional oil condensers, be liquefied into oil and stored in the oil tank. The incondensable gas through desulfuration and dedusting by hydroseal will be led to the furnace for recycling. 3. Cool down the reactor before make sure all abovementioned has been done. 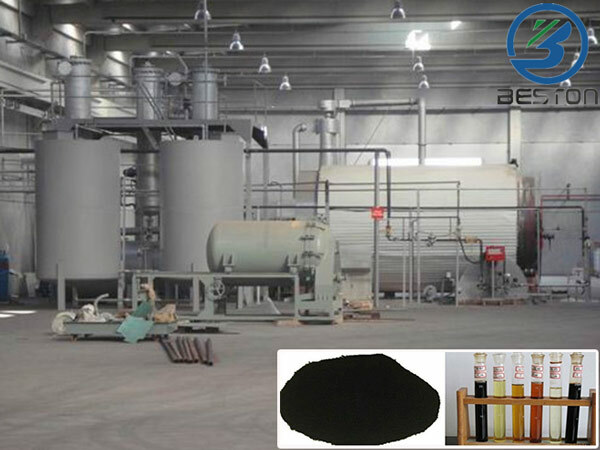 Carbon black will be discharged when the temperature reaches at 40 ℃. 1. The latest heating system can not only prolong the reactor’s service life, but can also increase the heating speed. 2. The service we afford is the first-class. 3. The conversion of waste plastic to fuel oil is environmental-friendly, and you can make a lot of profits from it. 1. We can design the installation drawings according to your site. 2. Our plant has 1 year warranty, and our professional engineers are available to service you at any time. 3. You can enjoy the periodical call visit, which can make sure there is no problems of the equipment. 5. For each set of machine, we can send one technician to guide your installation, test the machine and train your workers. Besides, we will provide one month’s service for free. Get your free inquiry now!